4 Bed rooms,2 being master suites,3 bathrooms,sleep 8. Beautiful colonial house in the historic district of Granada. Quiet street but 1 block from the local market or the supermarket.,3 blocks from the 'Parque Central ' and all the restaurants. Upon entering the house ,you have a cheerful room with TV and DVD, player, it open to a great courtyard with pool and lush vegetation . Around it you will find 3 seating areas ,the dining room,and the open modern kitchen as well as a bed room with bath and another bed room with loft who could be used as an office as It has a door to the street. Next to that room is the garage for small or medium size car only. Upstairs you will have 2 master suites, queen and king,linked by a great sitting balcony overlooking the Mombacho Volcano. All bed rooms but the twin rooms have air conditioning, solar hot water. There is also a washer and dryer. After growing up ,me in France ,my husband in Germany we met at the university in Paris ,and moved 40 years ago to New York city where we spend our working life and where our children were born!! For the past 9 years we have split our time between Sarasota Fl and Burlington VT,unless we are traveling the world or enjoying Granada. in 2006 we came to visit friends ,who were developing beautiful condos in Granada,one week was enough to make us fell in love with the city and his people and buy that beautiful house. This house his an oasis of calm in the city, it is big but even perfect for 2 people. What we love is that we can walk everywhere ,safely ,and at each turn there is somethink unique to see!!! All bathrooms have hot water. All bed rooms but the one with 2 twin beds have air conditioning as well as ceiling fans. All other areas have ceiling fans. Easy parking on the street not advised. at night.No large car in the garage. New large fridge with freezer. Pots and pans.mini food processor.Ample shelves storage . Nice dinnerware sets,coffee mugs ,glassware ,cuttlery. Table for 8,next to the kitchen area,nice open view of the courtyard. TV in the living room .Smart Tv in master suite. Tv in other 2 Queens bedrooms. Loved the house and the location. Spacious and comfortable, within minutes of major attractions in Granada, like La Calzada, Parque Central, La Merced, and more. Owner, caretaker and housekeeper very easy to deal with. Does not look like much from the outside, but once you get in.... WOW! Beware or electric bill, does creep up on you, even with electric credit. This incredibly immaculate home is perfect for two or even eight people. Three bedrooms have efficient A/C(one bedroom does not have a/c but fans keep it cool at night). It has the ambience of a boutique hotel with several comfortable seating areas around the courtyard with the garden and the pool as a showcase. Perfect, safe location 3 blocks from Central Park. The owners, manager, and housekeeper do everything to make sure you have what you need. Extremely well maintained. Solar hot water saves money on electricity and is always plentifful. Pictures do not do this home justice. We highly recommend it. My wife and I spent 12 wonderful nights at this house. What made it even better is that one of our daughters, her husband and 4 young boys got to stay there too for a week. It is a very big home not far from Central Park and in a safe area. It has 3 big bedrooms and one room that can be used as one but there are no windows and it can become very hot. The pool is in the middle of the inside courtyard and it's very refreshing any time of day.There is an open kitchen with plenty of utensil, a dining room and two more area to relaxe in on the main floor. Upstairs there is a little area where you can sit and seee the volcano Mombacho. There is a washer and dryer which you can use but the washer has to be watch while it's on because it makes a lot of noise and shakes a lot.We would not hesitate to rent it again. in a word. . spectacular!! to Nicaragua to study Spanish, and travel. The Casa Buena Vista offers more than the photos can do justice and exceeded my expetations--the pool in the center provided a bit of tropical paradise and luxurious comfort --the home was beautiful and roomy ( for us it felt downright palatial ) --Neil ( the caretaker there ) was more than helpful. I only wish we were all there now. . .
We were three couples who stayed at Casa Buena Vida in early May 2015. It is a wonderful home that we all enjoyed tremendously. 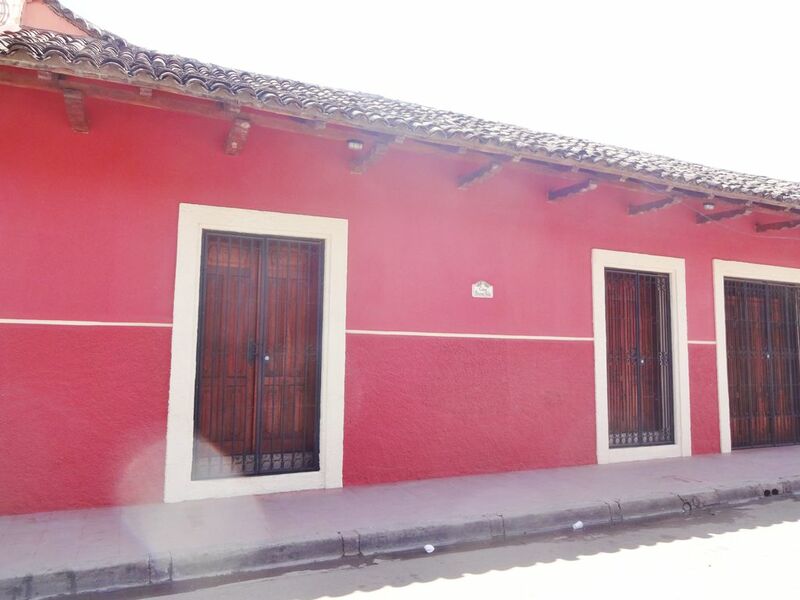 It is spacious, comfortable and well located in Granada. The pool - ah, the pool. Given that it has good exposure to the sun through a good part of the day, the water is gloriously warm (30-32 C) but still refreshing after a walk-around of Granada. This was by far the favourite feature of all members of our party. And the waterfall lends a nice ambience to the pool experience. The three main bedrooms are all spacious and well-appointed with ensuite bathrooms. My wife and I stayed in the lower bedroom and the ensuite shower had the best water pressure of the three in the house. We never turned on the AC - the ceiling fans were more than comfortable for sleeping purposes. The kitchen is well equipped and very pretty. We did little cooking (a few breakfasts) but if one wants to make more meals, the kitchen is certainly equipped for it. The living areas of the casa are well distributed and provide plenty of space to spread out. Even with three couples, there is always a place to "get away" from others to read or snooze. There is a garage in the house and we managed to fit a small van into the garage with no problems (tight but very do-able). WIFI is excellent and reliable (except when a tall truck on the street took out the wire that connects the house to the system. But Neil, the property manager, was exceptional in getting it repaired within 24 HOURS! almost unbelievable in Granada. Speaking of Neil, he is a huge asset. Friendly, helpful and always cheerful. In addition, the made (M-F!) is wonderful and the pool guys too. All in all, Casa Buena Vida was perfect for us. It is located a few blocks from Parque Central and La Calzada and the majority of restaurants and attractions. Only two blocks from the Pali (the locals' supermarket) and a 15-20 minute walk from La Colonia and La Union, the well-equipped "gringo" supermarkets. If there there is one criticism, it is that the street it is on is busy (and therefore noisy). But it is more than tolerable and lends to the local flavour. Nicole, the owner, was very responsive and helpful. If you are going to Granada and need space for couples or family, you need to look VERY closely at Casa Buena Vida. Highly recommended. Beautiful Unesco colonial city surrounded by lush mountains and lakes. It is a joy to walk in the city with all the restored churches and the colorful houses some image of the colonial splendor .Within walking distances Granada has restaurants for all budget, and the food is good.The city is very safe and the people friendly.Easy to rent a car or take an inexpensive taxi ride to explore the surrounding : craft markets, volcanoes or go swimming in lake Apoyo. For weekly rental $ 200 security deposit paid upon arrival.Paid to property manager. For monthly rental a $ 400 deposit upon arrival. Due to the cost of electricity in Nicaragua weekly renters have an allowance of $ 60,all amount above will be at their cost. Monthly renters will pay electricity. Long term rentals available at discount. The house is fully insured for rental use and rentals are reported to the IRS.